The United Kingdom will leave the European Union after the referendum vote known as Brexit won 52% to 48% on Thursday. The European Union – often known as the EU – is an economic and political partnership involving 28 European countries, which began after World War Two to foster economic co-operation, with the idea that countries which trade together are more likely to avoid going to war with each other. 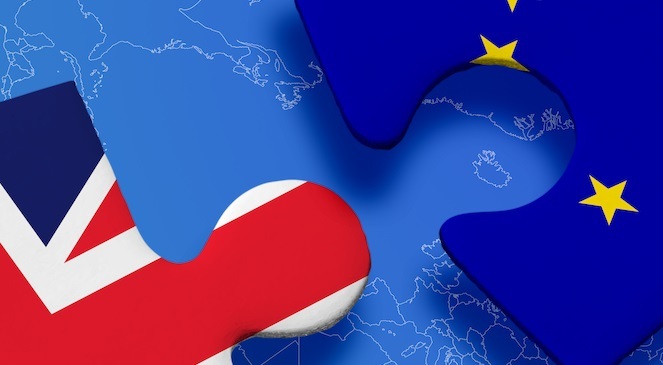 ETF Trends reached out to leading experts relating to how the Brexit vote will affect exchange traded funds and currencies. With the U.S. stock market selling off and investors flocking to the relative safety of bonds, following the “Brexit” vote yesterday, S&P Global Market Intelligence thinks investors should look closely at to mid- and small-cap dividend paying securities as well as investment-grade focused bond products. Questions are being raised about the economic health of not only the U.K., but the remaining E.U. countries, and these U.S. companies are more insulated according to Sam Stovall, U.S. equity strategist for S&P Global Market Intelligence. In addition to individual stocks, there are some strong income oriented ETF choices to consider relative to the 1.57% yield offered by the 10-year Treasury bond. ProShares S&P Mid Cap 400 Dividend Aristocrats (REG) holds 46 companies that have raised their dividends for 15 or more consecutive years. Financials (28% of assets), utilities (20%), and industrials companies (17%) are well represented in the portfolio, but all GICS sectors but energy have representation. Investors that are seeking individual stock ideas can look inside here for inspiration, but should be aware not all securities are undervalued. For investors seeking small-cap dividend approach, WisdomTree Small Cap Dividend (DES) is a strong candidate. Rather than focusing on the dividend record of the company, as REGL does, DES looks at the dividends the company is projected to pay in the coming year. While financials (25% of assets) and industrials (17%) are widely held, so are consumer discretionary (17%) securities. Meanwhile, SPDR S&P Dividend (SDY) holds a mix of large-, mid-, and small-cap stocks within the S&P 1500 index that have raised their dividends for 20-plus years. While AT&T (T) is a top-10 holding, so are mid-caps National Retail Properties (NNN) and Old Republic International (ORI). Financials (24% of assets), industrials (15%), and utilities (14%) are the largest sector exposures for this ETF, which has a 0.35% expense ratio. We think dividend-growth focused ETFs remain appealing, particularly as the flight to safety has pushed down bond yields. For investors who are still looking for traditional income in the form of bond ETFs, should also consider investment-grade bond products that look beyond traditional Treasuries. The passively managed iShares iBoxx Investment Grade Corporate Bond (LQD) and the actively managed SPDR DoubleLine Total Return Tactical (TOTL) are two such examples that take on moderate credit risk, but offer compelling yields. Both have 3% 30-day SEC yields, though they hold different bonds. With markets pricing in very little chance of a leave vote, the response has been STRONGLY negative. S&P Futures are off 3.6 % currently, trading as low as 1999, Nasdaq and Dow Futures are also off over 3 percent. The real carnage is expected in Europe—the bank heavy (most exposed sectors) Eurostoxx index is off nine percent, while the FTSE 100 is off 4.7%. CAC and DAX futures are off 8.5 and 6.5% respectively, while Spain’s IBEX is the worst hit, down 12%. The US 10 year yields sit at 1.53, gold has rallied 5% and the Dollar Index is up 2.5%. The Japanese Yen, a safe-haven currency in times of distress is up 3.6% vs the dollar and 6.5% vs. the Euro.